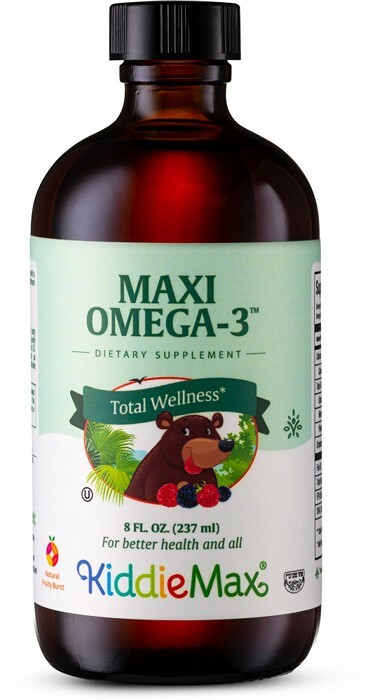 Maxi Health Research® is proud to provide you with Liquid Maxi Omega 3™ Fruity Burst, naturally flavored kosher SALMON fish oil bottled with you and your entire family in mind. Don’t leave Omega-3 levels to chance. Take delicious, all natural Liquid Maxi Omega 3™ with its delicious Fruity Burst Flavor every day. Make it a family activity! Take one teaspoon daily with a meal, or as directed by a healthcare practitioner. Refrigerate after opening. Other Ingredients: Stevia leaf extract, mixed tocopherols, natural fruit flavor. Contain kosher approved fish (salmon). This product contains no gelatin, corn, soy, wheat, gluten, yeast, salt, sugar, milk, artificial flavors, preservatives or colorings.